In this tutorial, I want to show how to use the Inbox Repair tool Scanpst.exe or Scanost.exe OST Integrity Check tool to recover email messages in Microsoft Outlook. Recently I had experienced an error in my Outlook mailing tool. I used first ScanPST then ScanOST tools to repair my mailbox. As a last step, I had to move my .ost file to enable exchange server to synchronize the .ost file contents which replaces corrupted local datafiles from mail server. 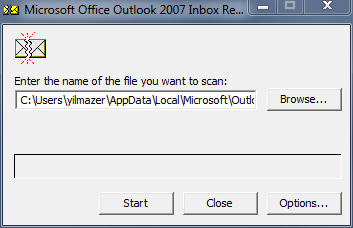 C:\Users\yilmazer\AppData\Local\Outlook\outlook.ost. Quit Outlook and all mail-enabled applications, and then use the Inbox repair tool (Scanpst.exe) to diagnose and repair errors in the file. For more information about the Inbox repair tool, see Help. As mentioned in the error message, I first closed Microsoft Office Outlook and mail-enabled Lync messaging application. Then I run ScanPST.exe aka Microsoft Personal Folders Scan/Repair Utility tool. For a Microsoft Office Outlook 2007 installed on Windows 7 PC, the Scanpst.exe Outlook repair tool can be found in "C:\Program Files (x86)\Microsoft Office\Office12" folder. 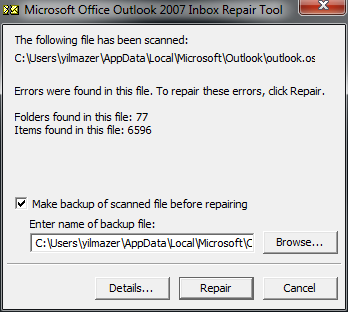 When the Outlook Repair tool is executed, you can point to the outlook data .pst file for scan. For my case the damaged Outlook .pst file was located in folder "C:\users\kodyaz\AppData\Local\Microsoft\Outlook" by default for a Windows 7 installation. Press the Repair button to let ScanPST repair reported errors for you. 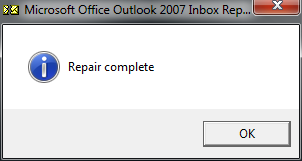 For more on how to use Outlook Repair tool please refer to Microsoft Support knowledge base article KB287497. An other tool to repair Outlook data files is the .ost data file scan tool named as SCANOST.EXE OST Integrity Check Tool. Before running scanost.exe you must quit Outlook. When you are ready double-click on the OST Integrity Check tool. OST Integrity Check tool enables the user to choose specific mail folders or choose to scan all folders. Choose the mailbox folder and mark "Repair errors". Then press "Begin Scan" button. After OST integrity check scan and repair process is completed, below message is displayed. At the end of the process, you will see a mail in your Deleted Items mailbox with subject "OST Integrity Check" Here is a sample OST scan result. 20:11:54 Beginning offline folder file integrity check. 20:11:54 Performing integrity detection scan. Additionally you can find a log entry like below on the file folder where your .ost and .pst files located. When I checked those logs after scan tools are executed on the Outlook data files, I saw below log entries. 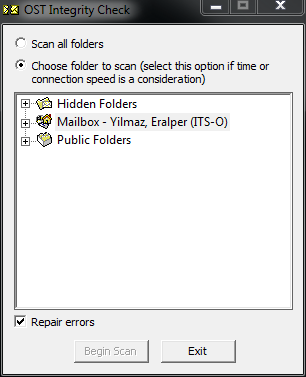 If ScanPST and ScanOST don't help, as a last chance, I moved the .ost file outlook.ost from its default folder C:\Users\yilmazer\AppData\Local\Microsoft\Outlook to another folder. After data file is moved, I run Microsoft Outlook. When Outlook started to run after the .ost file is moved away (as a backup), the message folders are populated with messages from server and stored locally in a newly created .ost file which is replacing the corrupted Outlook datafile.